“AVAST virus database has been updated” is probably the most recognizable part of avast! antivirus for most users. It is common knowledge that having up-to-date security is important. Actually having any software up-to-date is important. Installing the updates and patches can prevent new vulnerability exploits from happening and is as important as having good antivirus installed. Obvious, isn’t it? Well, not quite as this statistic shows. According to EUROSTAT research, 7% of all internet users in Europe don’t update their security software. The leader in this sad statistic is France where 15% of all internet users don’t update. On the other side of spectrum there is Finland where Eurostat didn’t find anyone not updating. Well done Finland! It is even more interesting to look at the reasons why users don’t update. 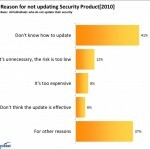 The majority of these users (41%) do not update their security software because they simply don’t know how to do it. Hmm. Perhaps vendors could do a better job here to make this even more simple. Some (12%) do not update because they find it unnecessary as they perceive the risk “too low” to bother. This I simply don’t get. First you install the antivirus because you think you need it and then you let the license expire because the risk is ‘too low’ to worry about it. That’s nuts, isn’t it ;) Come on people! Some (8%) don't update because it's “too expensive”. Oh please! If you don’t want to pay Norton, get avast! for free. Or any other free brand. There are many to choose from. Some (6%) don’t update because they don’t think the update “is effective”. Well I do have some sympathy here with this point. I once downloaded a patch (it was not antivirus…) that was a whooping 500 MB and as far as I could tell, half of the issues the applications had were still not fixed. And finally, there is an additional 37% of users who don’t update for any other reason or because they simply don’t know why. This reminds me the famous: “don’t know and have no idea why”. Have a good start of the week. And please… UPDATE!